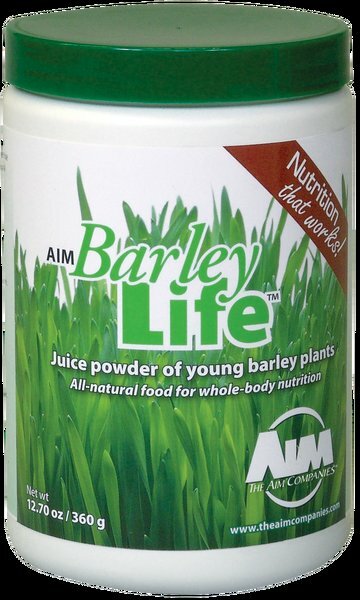 Barley grass powder, one of the green grasses that is a life sustaining food. A plant based diet that includes juicing and barley grass powder is one of the healthiest lifestyle plans ever devised. 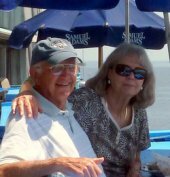 In 1999, I charted a new direction for my life after a diagnosis of prostate cancer. You may have already read my story in "About Us". I declined any medical treatment and proceeded to change my diet and lifestyle. I followed the Hallelujah Diet and lifestyle in lieu of standard medical treatment for prostate cancer. I have been studying plant-based nutrition and plant foods since adopting the new lifestyle. 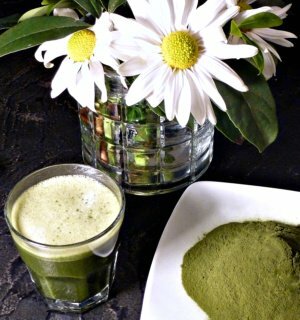 Barley grass powder has been a major part of my recovery from cancer. It is also and indispensable part of my maintenance diet and lifestyle. As a result, I have been able to sustain and enjoy good health. Good health, to me, is taking no medications at all...and I'm not sure my recovery from cancer would have even been possible without the power of the green barley powder. Green grasses and phytoplankton in the seas are the basis of all life on Planet Earth. Without their presence there would be no life! The action of sunlight on live green plant forms combined with carbon dioxide and water produces life sustaining foods as well as producing life giving oxygen as a by-product of photosynthesis. The largest animals that still roam the earth...like elephants, rhinos, giraffes, gorillas, and even the whales and sharks that swim in the seas are all dependent on green plant forms. These huge animals get all of their growth directly or indirectly from the protein, carbohydrates and fats that are present in the green plants. Even the carnivores on both land and sea are sustained by animals and sea creatures that consume green plants. Without plant eating animals, carnivores would cease to exist. All life is sustained by green plants. We have a cat who has been with us for about 14 years. She found us when she was 2 or 3 years old. Someone discarded her in our neighborhood, and she decided that we would be her new home. She is still quite wild after all these years, however she will come in the house for awhile to visit with us. 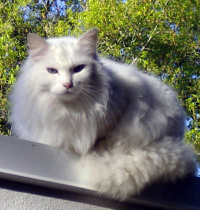 About 4 years ago, she stopped appearing at our back door for her food. We finally found her dirty and flea infested lying in the backyard. She looked terrible and we thought she was dying. The thought occurred to take her to the vet, however, it is very difficult to impossible to pick her up. So we didn't do this. Remembering that dogs eat grass when they are sick, we thought if we could get Miss Kitty to eat some barley grass powder that she might start feeling better. So, we bought some pill pockets for cats. We prepared one by stuffing it with green barley, and coaxed her to eat this. She did. The next day we did the same thing. Miss Kitty started to eat some of her food, and in about 5 days, she had cleaned herself up, and has been well ever since. We still continue everyday to give Miss Kitty a dose of the barley grass powder. Mom said, "Eat Your Vegetables!" This was good advise and still is. Salads and vegetables were the major part of your dinner plate during most of the 1900's. Today, green products are mostly absent from family meals. We consume processed foods that are mostly food-like things that are calorie dense instead of nutrient dense. These foods are also devoid of most of the essential life giving elements that are found in whole plant foods and filled with elements that are toxic to your body. Today we also eat large quantities of animal products (including dairy) that are laced with growth hormones and antibiotics along with genetically modified foods. It is obvious that antibiotics and growth hormones are detrimental to our health, but we have no idea of the long term health affect of genetically modified foods that are about 80% of all soy and corn products in human and animal food. No wonder we continue to get sicker and sicker as a nation! This wonderful green powder is a super alkaline food. The answer to our health problems...as Kermit the frog says, "It's good to be green!" When we learned that DISEASE LOVES AN ACID BODY, this is when we realized that we needed help in maintaining an alkaline one. It is so important to maintain a diet of enough vegetables and fruits, especially green vegetables. By taking a green juice powder supplement, for us, was the way to go. In our search for the best product, we finally decided on AIM BarleyLife. In our opinion, it is the purest and most potent product we could find. Since 1999, we have enjoyed health and energy that we never experienced in our younger years. Sometimes, with the busy schedules that most of us have, we don't get the proper nourishment we need everyday. 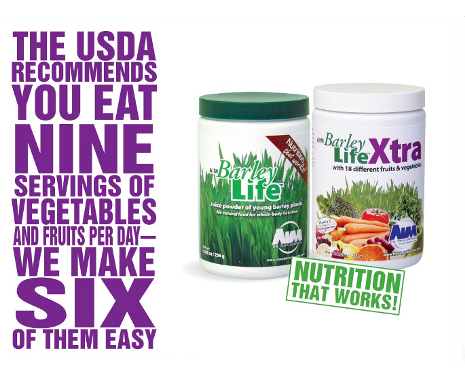 The BarleyLife is our insurance that helps us maintain the fuel we know our body needs, and most importantly keeps our immune system strong. Barley grass powder and other whole plant foods, will play a major role in creating excellent health for us all. BarleyLife - This green juice powder is a whole food concentrate with a complete nutritional profile - from pH balance to essential vitamins and minerals. One rounded teaspoon equals 2 - 3 servings of fruits or vegetables. Alkaline Foods - Find out which foods are alkaline and which ones are acid. Three alkaline super foods are barley grass powder, soy sprouts and cucumbers which have alkaline values of over +28.